By guest writer | February 15, 2019 | This post may contain affiliate links, which means we may receive a small commission, at no cost to you, if you make a purchase through a link. Read our Disclosure. We’re thrilled at the opportunity to guest post for Caz and Craig and share one of our recent adventures with you all — our visit to Iguazu Falls in South America — a natural wonder we think should top everyone’s must see list! Poor Niagara!’, Eleanor Roosevelt reportedly said upon seeing Iguazu. Gerard and I had the chance to visit both sides — Foz do Iguacu (Brazil) and Puerto Iguazu (Argentina). I’m surprised I never heard much of the falls prior to our South America trip and I think it’s because when you think of waterfalls, Niagara or Victoria often comes to mind. Well, that’s all about to change. Arguably the most beautiful natural wonders I’ve ever seen. So you’re probably wondering.. Which side of the Iguazu Falls is better? The equal opportunist in me would say, both sides are great! That’s the honest truth. You should definitely see both. Having had the chance to visit both sides of the fall, I have my favorite and so does Gerard. But before you make your pick, it all depends on what you want to see. And how. Here’s hoping to help you decide. 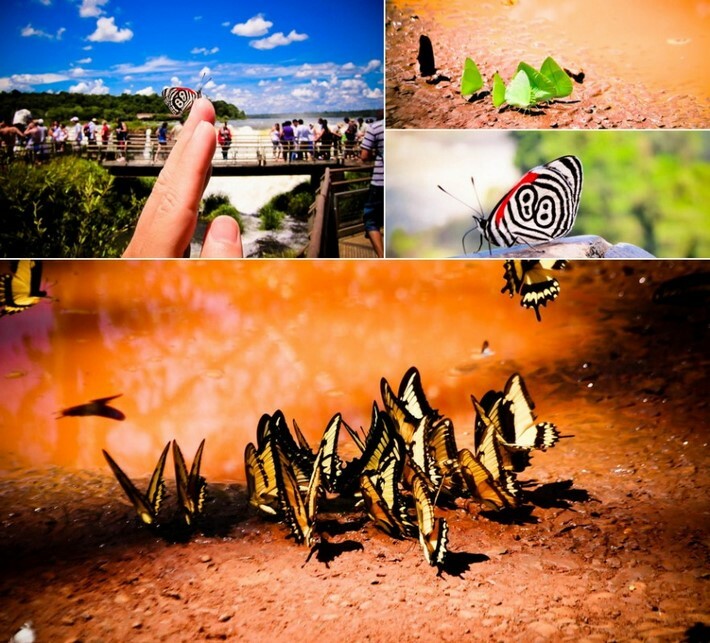 Which side of Iguazu Falls did we prefer? The best view is all in how you prefer to see it. By land or atop? For a panoramic view, picture perfect postcard of the falls, head on over to the Brazil side. Consisting of a network of 275 waterfalls spanning an area of 3 km wide, virtually every angle, a 360 view, is incredibly breathtaking. It’s impossible to take a bad photo here. If you want to experience the falls from atop, that’s on the Argentina side. It’s hard to understand the sheer power and enormity of the falls from ground level. Here on the Argentinian side and a view from the top, you will understand why Iguazu holds the title for the greatest average annual flow of water in the world. Fair warning, you’ll get mist a little. If you enjoy a good hike, the Brazil side is for you. It’s approximately a slow 40-minute hike to the falls. The hike was relatively easy, with minimal steps and uphill trek. I’m not much of a hiker but this was doable in my books. Plus, when you hike, you get to see a lot of smaller falls along the trails. Perfect photo opportunity virtually every step of the way. If you’re not a hiker by nature or have trouble accessing uneven trails and steps, you can stay on the double-decker bus and it will take to all the way to the end where you can take the elevator down to see the falls (no hike!). If you’re traveling with family and/ or persons with disabilities, the Argentina side is more equipped for your needs. With built in catwalks over dirt and gravel, the Argentinian side is definitely more pedestrian friendly. The steel trails and bridges makes getting to the falls easily accessible for all ages. The Argentinian side has a train system with (3) main stations — Estacion Central (at the entrance of the park), Estacion Cataratas (lower circuits) and Estacion Garganta del Diablo (Devil’s Throat) allowing for easy transport to different viewing points of the falls so your walk is minimal. If you’re deathly afraid of insects and bugs, the Brazil side is not for you. We were nearly eaten alive during our jungle ride through the forest and water boat ride. However, if you love birds (like we do), visit Parque du Aves. The bird park is not located within the Iguazu Falls’ premises. It’s a completely separate park conveniently located across the street! Completely worth a trip back (and the extra stamps in our passports) to the Brazil side. If you enjoy wildlife, the Argentinian side offers a variety of exotic birds and butterflies, not to mention daytime raccoons for no additional cost! They’re everywhere so be on the lookout. There is a jungle bus ride before you reach the boat. You’re not going to get wet. You’re going to get drenched! Iguassu Falls Boat Ride from GQ trippin on Vimeo. 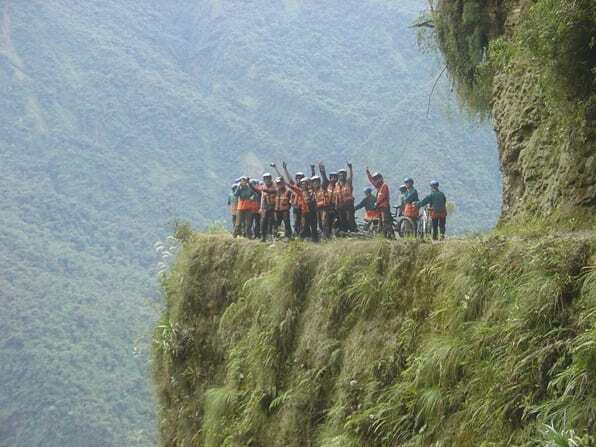 You can rappel down the waterfall, zip-line through the jungle on the Argentinian side. We did neither for lack of time but we hear it’s great. However, I consider the walk to Devil’s Throat an activity as it was a great experience and quite enjoyable for us both. At times, the catwalk bridges over waterways and offers some amazing views. Like this one! The helicopter tour is only available on the Brazil side. Rainbows — single or double — is best seen on the Argentina side. Bring water and bug repellent for Brazil, a hat and sunscreen for Argentina. Puerto Iguazu (Argentina) is cash only! Now that you have the facts, we have one question for you. Are you Team Argentina or Team Brazil? The Brazil side may have given us the best shot from the entire trip, but our vote is for the experience with Argentina. The Argentinian side had a lot more to offer — comfortable trails, different viewing points and numerous activities to choose from. Plus, double rainbows and colorful butterflies are far better than giant mosquitoes and spiders! Bio: We’re Gerard and Kieu from GQtrippin.com! To sum our story in short, G’s job quit him and I (Q) am taking a career break to travel (half) the world — New Zealand, Australia and Asia to be exact. The journey starts December 27, 2011 and we can’t wait! Join us for travel adventures and great indulgences across the globe. Do say hi to us on twitter or facebook. The land view looks incredible. Great shot! All the more reason to come back to S. America! 😉 It definitely deserves a few extra days in your trip but you’re gonna love it! Thanks for letting us guest post. We really hope more people get to see Iguazu Falls, it’s definitely one of the highlights for our South America trip. I’m Team Brazil all the way. For me, the panoramic views are unbeatable. I went to the Argentina side first and although the Devil’s Throat is loud and you can see a lot of water falling off the top, the mist rose so high that I could only see a few metres down. I had NO IDEA just how big it was until I went to the Brazilian side and you can stand infront of it. That made it so much more impressive for me. Totally! The panoramic view is incredible. Hard to describe how ridiculous it looks even in pictures. I think it’s also great that you saw the Argentina side first before seeing the Brazil which made it so much more impressive for you. We had the same feeling but did it backwards. Lol. Thanks for your comment! I wanted to tell you that the falls were also featured in the movie The Mission, with Robert de Niro and jeremy Irons, an excellent film. Cool! We’ll put it on our movie list to see when we return to the States. Wonder what other movies Iguazu Falls is featured in. It makes me feel a little better knowing I’ll only get to see them from this Argentina side this time around! Sweet!! Make our decision a lil easier when we get there in a couple of months!! Great post!!! We can’t wait to see your photos! How’s C. America treating you guys so far? I went to Iguazu a couple years ago, and both sides were great. Weather plays a huge role in scenic shots. It was bright and sunny with rainbows everywhere on the Argentina side, and it was misty and cloudy on the Brazil side the next day. Definitely agree that you can really see/feel the power of the falls from the Brazil side, but the Argentina side has more rainbows and more to offer. Great post! Thanks, guys! You definitely should visit both sides. They’re so different it was hard to do a comparison, rather just listing the facts. But either or, or both, you won’t be disappointed. Enjoy! Nice post ! In this post the photos presents great scenery that attracts visitors to this place. Thank you! 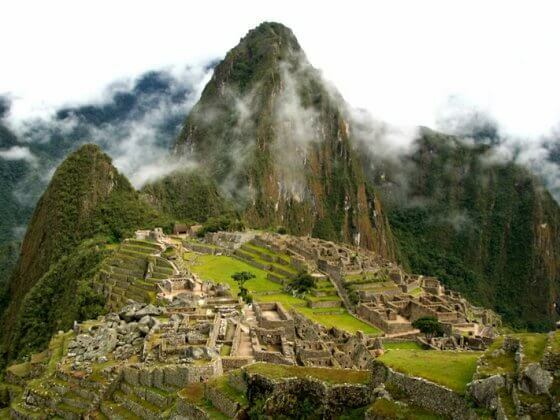 Definitely worth visiting if you’re in South America. The views are breath-taking. But if (or when) I go back, I want to take the helicopter, must be amazing to see it from above, although it’s supposed to be quiet expensive. Hi Juana! Glad you enjoyed the Argentinean side. We loved both sides of the fall, it was a tough call. But definitely consider the Brazil side if/when you return for the helicopter tour and the best panoramic view. The Brazilian side has a lot to offer as well. 😉 Cheers! This is such a timely post for me! I’m off to Rio for Carnival next month and really wanting to take a side trip to Iguazu Falls. I think reading this post helped make my mind up. Thanks. Hope you’re having fun in NZ! Thanks for your comment Marcelo. After translating your comment through google, we have to agree. Argentina is better slightly. Wish we had a little more time to fully explore the falls. Double rainbow!! This place spuds amazing…! Great post! 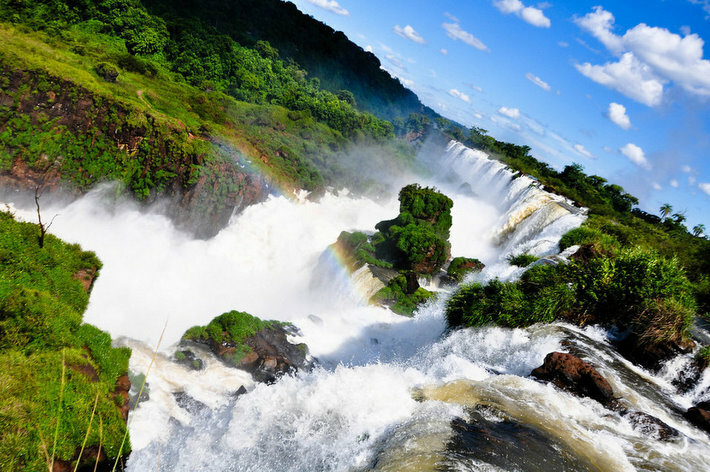 I have only ever been to the Argentina side of Iguazu, but would love to go to the Brazil side to compare the two firsthand! Thank you for your comment, Clara. I don’t Iguazu has a bad side judging from what we saw. 🙂 The panoramic views are incredible! Enjoy and let us know what you think! I wish so much that I made it up here when I was in South America – I spent a large portion of my time in Patagonia so didn’t get to head as far north as I would’ve liked. Your photos are stunning! Reminds me of how much more I have to see when I go back. Hope you are enjoying Sydney and good luck with the rest of your travels! I would love to return and hit up Patogonia. There’s so much to see and do in S. America I think it’s underrated some times. Sydney was great! Finally got the Asian food we were craving. Lol. Thanks for your comment! I wish I did a panoramic video. There were rainbows everywhere! Crazy beautiful. Definitely put in our your list! We only went to Rio and it was awesome! How do you get from the Brazil side to Arg side? We plan on flying into Brazil side, staying a night and then heading to Arg side and seeing that for the day, we’re flying to BA the following morning. There are shuttles from each town center on both sides. You can even hire a taxi for the day. Beware, the border office will take up lots of space each time you cross the border! So you hope you have empty passport pages! Flying into the Argentinean side will makes things a lot easier. It’s very very very hard work when you are trying to comparing within Brazil and Argentina, you can define easily where you have already tour like if have make a tour in Brazil then you can define about Brazil easily, no doubt Brazil have good beauty, but i want tell you also about Argentina that have so attractive place for travel. here you will get a best tour like beaches, resort, hotel etc. so i think comparing within Brazil-vs-Argentina it’s very hard word. Both countries are amazing places to visit. 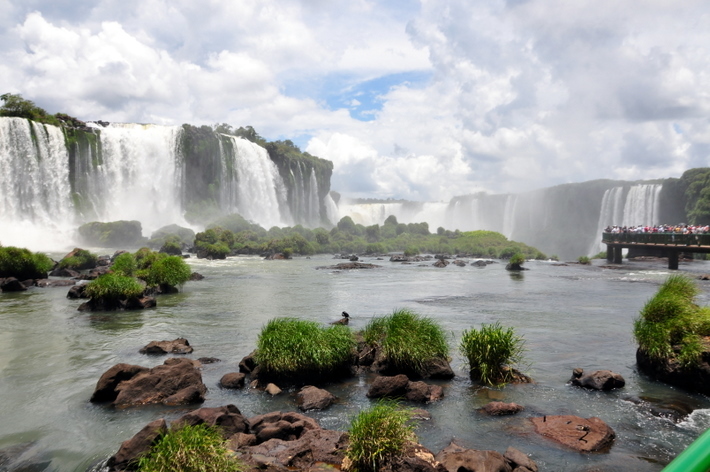 Personally for us, the landscape of the Iguassu Falls on the Argentinean side was more scenic. Don’t get us wrong. We love Brasilia! We spent New Year’s on Copacabana beach in Rio and it one of our most memorable experiences traveling. 6 times?! Haha, did you have a useless poncho like we did? 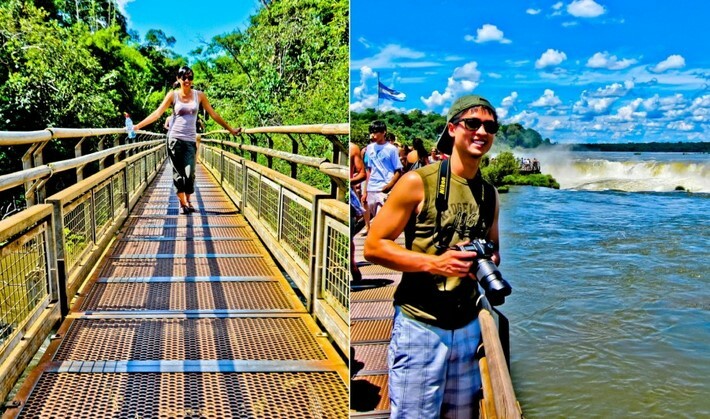 Glad you enjoyed Iguacu and hope you had an amazing trip in Brazil. Cheers! We will be staying on the Argentine side. Is it worth the $180 ($160 visa +$20 processing) to go to the Brazil side for one day? We won’t have any other time to spend in Brazil, so we are trying to determine if the cost of the visa is worth the visit. If you don’t plan on seeing anything else in Brazil, we’d probably skip the Brazil side this time around. However if you are from the US and planning to make it back to Brazil someday, keep in mind the visa is good for 10 years! Hi guys, thanks for all the info.. I’m going to Brazil next month an keep considering which side of the falls to visit.. Do we need a visa if we are going from Brazil to Argentina? Another question. – how do we prevent valuables such as cameras from getting wet? Is it easy to get from the Argentinian side to the Brazilian side? How could we transport, how much would it cost and about how long does it take? hello, sorry i’m responding to this question late – hope its still valuable info for you. its very easy to get from one side to the other. we took either bus or cab, they’ll get you to border and everyone gets off and go through visa/ passport checks then meet you again back on the other side. simple as that. hope this helps and enjoy the falls! that’s one great blog post – thanks for sharing! We’re on the same wavelength with you guys. Both sides are gorgeous (it is the same falls) but those walkways in Argentina make the magic come alive. Id like to say that the boat trip is actually best experienced in Argentine side for me; after you get drenched, you could explore the “san martin” island along its own catwalks, thats another plus for Argentina. I would have loved to take a boat ride on the A side just to compare.. glad you enjoyed it! My husband and I will be traveling to Buenos Aires and will be taking a trip to see the falls. If we are staying overnight, can we see both sides in one day if we aren’t going to do any of the extras like the boat or helicopter ride? That might be possible, but you’d have to wake up at the crack of dawn and run through the falls. The Argentine side is quite vast and something you’ll need some time through to explore. If you had only one day, we’d recommend the Argentine side. Hi, first let me thank you for all the valuable information that you are providing through your blog. Having said that, I have a few questions. My wife Amy and I are traveling to Porto Alegre and Santa Maria in Brazil to visit her family. From there, we are taking a couple of days to see the falls. If I want to go to the Argentinian side, do we need a visa? If so, how much is it per person. I think I saw the same question in your blog, but in reverse form (going from Argentina to Brazil) Is it worth it paying for the visa to visit the park on the Argentinian side for just one day? We’re coming from Arizona, s it is a once-in-a-life time trip for us and we don’t really want to miss anything. Well, are you there? We’re traveling a few days from now. Sorry for the late response. No, you don’t need a visa to enter Argentina if you’re a US citizen. Thanks for your great article. Especially the summary about the additional activities on the brasil and argentina side are very helpful for me. How long do you think you need to see it on the Argentina side? is one day enough? Are there places to stay near it? Going to brazil for thenworld cup and going to the falls after. I dont require a visa in brz but will need one in arfentina. Saw some posts in other sites that booking a tour will not require visa anymore. Is this true? Can we get a visa in iguazu? Thanks for the great info. I am visiting the Falls in June on the Brazil side. I arrive in the morning and have that day to walk around the park and enjoy the falls. However, I only have one full day (the day after I arrive) to enjoy a tour. I really want to do a boat tour that takes you to the bottom of the falls. Is there a particular tour that you recommend? I am sure there are a few that offers this tour, but what is your best advise on how to choose between them? Thank you for your help. This was SO helpful – we’ve desperately been trying to decide how best to get there (from which country). Can’t wait to share it with my GF. Hi, thanks so much for the post! Very useful! Where would you recommend we stayed? I am definitely visiting both sides, though I am wondering where’s best to base at, in the A or B side? Or maybe a few day in both? Thanks in advance for your advice! i cannot make a decision, so better go both sides. I would start from brazil side, coz i have to.hiking is my favorite… so first hike and tour around all those beautiful falls. like you said, 360 angle view, hope it could be crazy whoa! 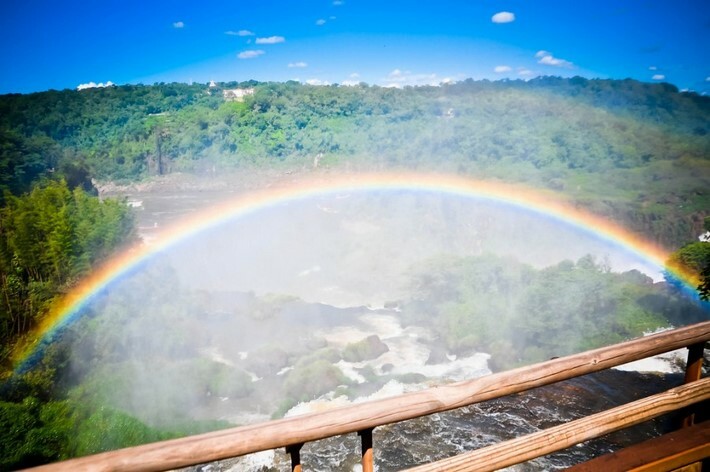 the rainbow photo makes the other side most attractive, so how can i drop the chance to next unknown time.but i got a question, is it possible to get an arrival visa on the border while across from brazil. if i plan 3 days for the trip, is it possible to overview both sides? what budget would it be?thanks for your post and comming suggestion. Great article! 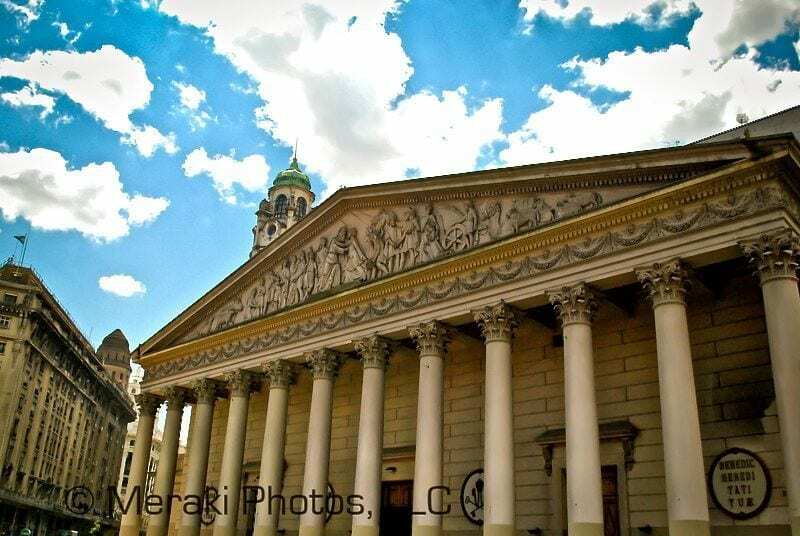 We wanted to visit both sides, but when we got the to the Argentina side, we were told we needed a VISA (we were traveling on a Canadian passport, but since we weren’t staying over, I hadn’t thought to look into the VISA requirements). It was too expensive so we headed back to the Brazil side. We were there in September so saw lots of butterflies on the Brazilian side, and did not run into the mosquitos and spiders you saw. We loved the boat ride! I don’t think I’ve smiled so big in my life! And yes, we did get drenched! Like you, I also recommend the Parque du Aves.